It's been a great 10 days or so for Neil Cornrich, the Beachwood-based football agent. One Cornrich client, punter Kyle Richardson, signed a fat free-agent deal with the Browns. 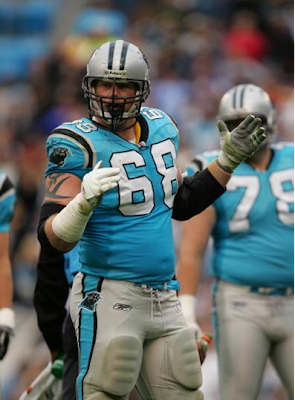 A second, guard Mike Wahle, got the richest contract ever for an interior lineman -- a five-year, $28.5 million deal [including bonuses] with Carolina. Yet another, New England guard Stephen Neal, received a massive raise in a one-year deal designed to keep other teams from signing him as a restricted free agent. And a fourth Cornrich client, former Ohio State star cornerback Dustin Fox, greatly improved his April draft prospects by recording a 43.5-inch vertical leap at the NFL Scouting Combine -- second-best overall. Green Bay - In refusing to meet the demands of an inflated free-agent market, new Green Bay Packers general manager Ted Thompson allowed the Carolina Panthers and Dallas Cowboys to strip him of two of his most dependable and effective players. But as difficult as it was to see starting guards Mike Wahle and Marco Rivera walk without compensation Thursday, Thompson felt no regret over the decision and vowed that the Packers would rebuild the position before the start of the 2005 season. "Those are losses," Thompson said after Wahle signed with the Panthers and Rivera with the Cowboys. "But this is what we do. We work at it and we try to assemble the best team we can, and maybe the next left guard and the next right guard isn't as good as the one we had before. "But maybe we're a little better somewhere else. That's the way we'll attack it and do the best we can." The Packers weren't surprised to see Wahle receive a deal that a source with access to NFL Players Association salary data said was worth $28 million over five years and included a two-tiered signing bonus of $11.5 million. But when Rivera received a five-year, $20 million deal that included a $9 million signing bonus from re-energized free spender Jerry Jones, they knew they were overmatched. Wahle's deal eclipsed the six-year, $32.3 million deal ($11 million in bonuses) signed last year by Packers left tackle Chad Clifton and provided him the second-highest signing bonus for a guard in league history.